The retina is the light sensing tissue at the back of the eye. It is nourished by tiny blood vessels that bring blood into (arteries) and out (veins) of the eye. 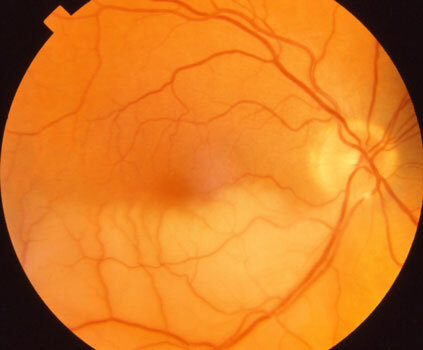 A retinal artery occlusion means that an artery in the retina has become clogged. The blockage causes sudden painless decrease in central or peripheral vision. 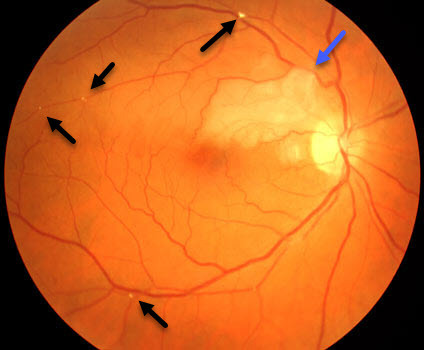 There are two types of retinal artery occlusions, branch and central. Branch retinal artery occlusion involves a blockage of a smaller artery. In a central retinal artery occlusion, the main artery entering the eye becomes clogged. The retinal tissue that loses blood supply downstream from the blockage almost instantly stops working. The injured retina becomes swollen and white. The damage is usually irreversible within 90 minutes of the occlusion. Whereas branch arterial occlusions cause peripheral and sometimes central vision loss, central arterial occlusions can cause severe and near total vision loss. The arterial blockage is usually caused by a tiny clot (embolus) that breaks off from the heart or from a larger blood vessel in the neck (carotid artery). The image on the right shows numerous such emboli (black arrows) that caused the occlusion (blue arrow). If another clot subsequently breaks off from the heart or carotid arteries and blocks a blood vessel in the brain, this can cause a transient ischemic attack (TIA) or a stroke. 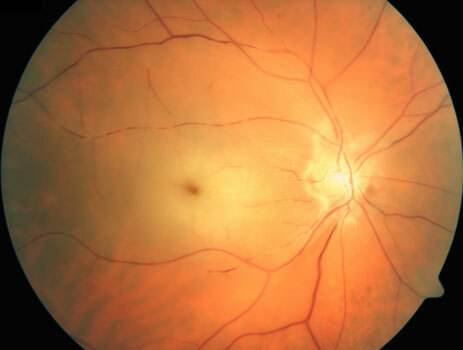 About 10% of patients with central retinal artery occlusions are caused by inflammation of this blood vessel from giant cell arteritis. If caught within hours of the occlusion, we are sometimes able to lower the eye pressure enough to move the embolus out of the clogged artery. Some patients can recover significant vision, although the vision loss is usually permanent for most. Many patients with an acute retinal artery occlusion may be at risk for a stroke or have already suffered an asymptomatic stroke. MRI scanning shows asymptomatic acute strokes in up to 33% of patients with branch retinal artery occlusions and 76% with central retinal artery occlusions. For this reason patients with acute occlusions are referred immediately to a stroke center for imaging (brain MRI scanning, carotid Doppler, cardiac echo) and blood-work. Emergent medical and surgical treatments are then coordinated while the patient is in the hospital.